Many of our operations have neighbouring communities. We aim to share benefits with these communities by helping to develop local economies, creating local jobs and developing skills as well as supporting communities with investment programmes. 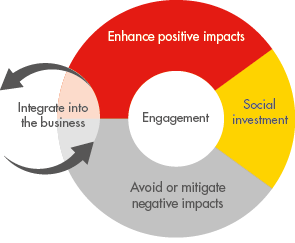 Community engagement is fundamental to our approach to sustainability within Shell. It helps to build people’s trust and is the basis for operating responsibly. Our projects and operations also create business opportunities for people locally, which can help people build livelihoods. Our major projects and facilities are required to have a social performance plan. This informs people about the social context for future operations and identifies any potential negative impacts on the community. The plans include community engagement activities, such as hosting local meetings, that help us to monitor the impacts of our operations (see opinion “Dave Brown”). It also identifies where we can support community development programmes. The social performance process can lead to changes in our plans and operations, if needed (see diagram). We work together with our neighbours to minimise impacts and address concerns (see box below). Our social performance teams include experts in specialist areas, such as indigenous peoples’ rights, cultural heritage and land acquisition, resettlement and livelihood restoration. We also train people as community liaison officers, who are often local residents, to monitor and respond to community feedback. For example, in the Netherlands during 2013, the Nederlandse Aardolie Maatschappij (NAM, Shell interest 50%) intensified community engagement following increased concerns about seismic activity. Community engagement included consultations with the local administrators, listening to the needs of the local residents and providing more information about operations. NAM produces gas from the onshore Groningen gas field in the Netherlands. The Dutch government has a 40% interest in the gas field and NAM a 60% interest. The government, advised by the regulator, reviews and approves the production plans for the field. NAM supports the recent plan proposed by the Minister of Economic Affairs to reduce production in response to increased seismic activity. We also strengthened our approach to social performance in 2013, so that operations within Shell consistently apply common global social performance standards. These are informed by recognised international good practice, such as the International Finance Corporation (IFC) performance standards. We have tight gas and oil operations in the Appalachia region in the USA. Over 18 months, we developed a community feedback pilot programme for people from nearby communities. This followed an unexpected volume of calls and complaints from residents in the area due to problems such as noise from our operations. Neighbourhood call centres were set up for the community to contact Shell. Our community liaison officers reviewed and followed up on every query. Shell also put systems in place to contact the community about upcoming site activity to reduce any potential interference that could affect people living in the area. Since 2011, Shell has contacted over 2,000 people about site activities and processed over 2,250 feedback requests from people in the community. Within two years, calls reduced to around 50 cases a month, after a high of 210 cases a month in early 2012. Appalachia’s community feedback programme was part of our work with IPIECA, the oil and gas industry association for social and environmental issues, to collaborate on the development of grievance mechanisms for the industry.